Cliff Linder has the passion to help young people succeed. Caring for livestock and people are two things that Cliff Linder knows about and is really good at. One way he has cared for his own cattle is by feeding them VitaFerm® for the last 20 years. 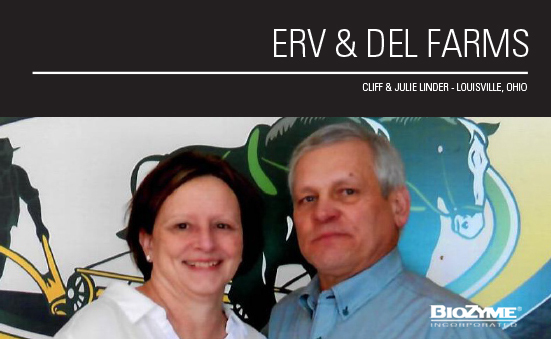 Therefore, when the opportunity to become a BioZyme® dealer presented itself nearly seven years ago, it was an easy decision for Cliff, who also owns Erv & Del Farms near Louisville, Ohio. A driving force behind his success thus far is that he truly enjoys helping his youngest customers learn and develop their own interest in the livestock industry. Cliff makes himself available to his customers, young and old, throughout the year, and they know he is just one phone call away. He said if they have a challenge or a question about their project he will help them to the best of his ability. If he can’t answer the question, he will call his ASM, Lindsey Grimes, or someone else in St. Joseph to find an answer, and he appreciates the speed at which his phone calls are returned. In addition to being accessible on the phone, Cliff makes sure he and his wife, Julie, visit their customers during the spring and summer to make sure all the show stock is eating and gaining. They also make sure they attend a day at the county fairs to support their young customers. Cliff said his love for the county fair spans nearly six decades, as he and his brother started showing at the Stark County Fair in Canton 57 years ago. Last year was his daughter’s last year showing, and there has been just one year in those 57 years, none of his immediate family exhibited livestock at the fair. Cliff makes sure all the young exhibitors and their animals are ready for the fair by hosting and presenting various clinics and field days that cover nutrition and health for multiple species in the area. He conducted a sheep clinic in mid-March, and typically works with other surrounding counties to teach young people and their parents the importance of a good nutrition program. He also attends spring jackpot shows to display products and discuss the benefits of the BioZyme products. “If you have animals, you want them to perform. An ounce of preventative maintenance will save you on a vet bill if your animals get sick or go off feed,” Cliff said. Not only does Cliff work directly with his younger members showing livestock, he works to provide service and answer questions to all his customers, and just hosted his annual dealer meeting this spring. More than 100 customers and potential customers attended the meeting where he and Grimes represented BioZyme, while the Umbarger ASM was also on hand to answer questions since Cliff is also an Umbarger dealer. He said the attendees had a chance to ask questions, learn about new products and everyone left with a door prize and full belly. As Cliff continues to grow his business, he continues to see more success with his junior customers. Success in and out of the show ring is one thing he is passionate about. With a willing attitude and a passion for the future, Cliff’s business is sure to thrive as well.